Are there any fast food restaurants approved by the South Beach Diet? Not exactly, but there are things you can eat at most restaurants that will allow you to stick to your diet and have a good time eating out with friends and family. Most people recommend that you do not try to eat out anywhere during the first phase of the South Beach Diet because you're still learning the system. You may become frustrated over the lack of choices or decide to splurge on an unhealthy meal rather than finding something that fits your diet. While there are no particular South Beach Diet approved fast food restaurants, there are options almost anywhere that can keep you on track after the first phase. Gone are the days of having to order a burger and not eat the bun. There are many other choices available, though at fast food restaurants many of them are salads. This salad features chicken, pinto beans, fajita veggies and tomatillo red-chili salsa on a bed of romaine lettuce. Skip the vinaigrette and get extra salsa to use as your dressing. According to Chipotle's nutrition calculator, this salad has 355 calories, with only 3g of saturated fat and 16 net carbs. The Monterey Chicken Melt Salad features grilled chicken, spinach, tomato, cucumber, red onion, and Monterey cheddar cheese for a total of only 190 calories, 3.5g saturated fat, 6g net carbs. Top it with vinaigrette for only 110 more calories, 2 more grams of saturated fat and 3 more grams of carbs. Make the salad even more South Beach friendly by holding the cheese. The Turkey Breast Salad over a bed of veggies of your choice starts at only 110 calories, with .5g of saturated fat and 8g of net carbs. 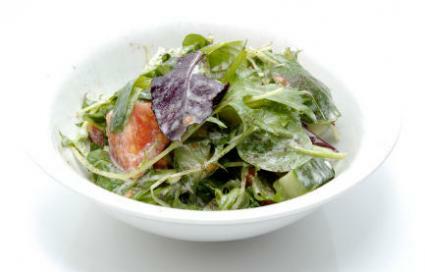 Again, stick with vinaigrette to keep your meal South Beach smart. The Bacon Ranch Salad with Grilled Chicken features mixed greens with grape tomatoes, carrots, cheddar and jack cheese and bacon. When you get it with low fat Italian dressing, you're looking at 310 calories with 5g of saturated fat and 14 net carbs. With low fat balsamic dressing, it's 300 calories, 4.5g of saturated fat and 12 net carbs. The Asian Cashew Chicken Salad features grilled chicken over a bed of mixed greens, cucumbers, tomato, edamame, and spicy roasted cashews. This salad has 210 calories, no saturated fat, and 9 net carbs. Top it with the Light Spicy Asian Chili Vinaigrette for 45 more calories, no more saturated fat, and 8 more grams of carbs. The 4 Piece Chicken Nuggets has only 180 calories, 2.5g of saturated fat, and 9g of net carbs. Choose the buttermilk ranch dipping sauce for only another 120 calories, 2g of saturated fat and 2g of net carbs. Choose the Shredded Chicken Mini Quesadilla if you're looking for a snack. It has shredded chicken, a three-cheese blend and chipotle sauce in a flour tortilla with 180 calories, 2.5g of saturated fat, and 13g of net carbs. The Egg and Cheese A.M. Grilled Taco has scrambled eggs and cheddar cheese in a soft grilled tortilla for 170 calories, 3g saturated fat and 14g net carbs. Fresco Tacos have fresh pico de gallo instead of other sauces and toppings that rake in the fat and sugars. Fresco tacos are available in chicken soft taco, crunchy taco, grilled steak soft taco, and soft taco varieties, and they range from 140-160 calories, 1-2.5g saturated fat, and 10-14g net carbs. You can add a side of black beans to your meal for 80 calories, no saturated fat, and 7g net carbs. Top your taco with guacamole for 70 calories, 1 additional gram of saturated fat, and 1 more gram of net carbs. According to Boston Market's nutrition menu, if you get the white meat skinless quarter chicken, you're only taking in 220 calories, 1 gram of saturated fat, and 1 gram of carbohydrates. The regular sized turkey breast is only 200 calories with no saturated fat and 1 gram of carbohydrate. The perfect side dish for your chicken or turkey, the fresh steam veggies have only 70 calories, no saturated fat, and 4 grams of net carbohydrates. The flavorful Garlicky Lemon Spinach side has only 110 calories, 5 grams of saturated fat, and 4 grams of net carbs. If you miss chicken nuggets on the South Beach Diet, you're in luck because Chick-Fil-A makes a grilled version. According to the restaurant's nutrition calculator, the 8-piece size has 140 calories, 1 gram of saturated fat, and 4 grams of carbohydrates. Be careful to avoid dipping sauces, however, as they are often full of sugar. The Chicken Salad Cup is made with eggs and celery and has 360 calories, but only 5 grams of saturated fat and 5 grams net carbs. A great dessert choice, a small fruit cup is 45 calories with no saturated fat and 10g net carbs. The Grilled Market Salad features mixed greens and romaine with cabbage, carrots, chopped apples, blue cheese, strawberries, blueberries and nut granola. Only 200 calories, 2 grams saturated fat, 13 grams net carbs. Pair with light Italian dressing for only 25 more calories and 3 more grams of carbs. If you get a 4 piece chicken nugget, you're looking at 190 calories, 2 grams of saturated fat, and 11 grams net carbs. You still have to be careful about sauces though, which can add in a lot of unexpected sugars. The Grilled Chicken Caesar Salad has 450 calories, 4.5 grams saturated fat, and 17 grams net carbs. You can lower your carbohydrate intake by avoiding the croutons. With avocado ranch dressing, the Side Garden Salad has 240 calories, 5 grams of saturated fat, and 4 grams net carbs. Whether you're going to a fast food chain or a sit-down restaurant, it pays to be prepared when you're on a diet. Most major restaurants have nutritional information and menus posted online, so you can get an idea in advance what you'll be able to order. If you eat out a lot, consider investing in the South Beach Diet Dining Guide, which provides diet-approved menu choices for hundreds of chain restaurants as well as local restaurants in some of the biggest cities in the United States. Eating out while following the South Beach Diet is not impossible. You'll be able to find good things to eat no matter where you are, even if you're in a rush.